Who would ever have thought that a mineral used initially to treat the dry flakes of dandruff would one day be used as an effective weapon in the fight against cancer? Well, that’s what happened with selenium, a mineral now touted as a “longevity supplement” that was once used primarily as a topical method to treat dry itchy scalps. That’s because selenium sulfide effectively slows down the rate of skin cell turnover on our heads, and also reduces the number of different fungi that can cause dandruff. But researchers also found that this mineral has other more important health roles, doing everything from reducing the viral load in people who are HIV-positive to improving thyroid function and preventing certain cancers. Selenium works by helping counteract the impact of the free radicals we have in our body, which can cause damage to our cells. Scientific trials have shown that selenium may prevent lung and gastrointestinal cancers, although the most recent research is casting doubts on lung cancer prevention claims. Trials have also shown that supplementation of this mineral can help people deal with the side effects of some cancer treatments. This includes increasing the appetite of women with ovarian cancer, and improving both hair loss and abdominal pain of people undergoing radiation treatments. Another touted breakthrough – that selenium can prevent prostate cancer – has proved not to be the case, although some trials are showing that the mineral can help deal with the most aggressive types of this cancer. And a 2010 study has shown that increased intake of selenium can decrease the risk of bladder cancer. 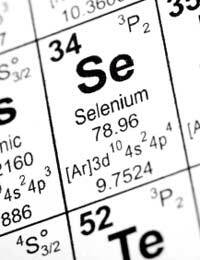 Selenium is present in many of the foods we eat, including poultry, whole grains, meats, seafood and many nuts. Many health professionals, however, say that we are not getting enough of this important nutrient from food alone, which is why they recommend taking a selenium supplement. Some trials, however, have pointed out that taking too much selenium can have the opposite effect, as people with too much in their blood have been found to have a higher cancer risk. And to top it off, the 2010 bladder cancer study said that women and men may accumulate and secrete selenium differently, meaning that taking different amounts for different genders may be warranted. At present, 70mcg for men and 55mcg for women is recommended. Selenium has been found to be helpful in the prevention of certain cancers, but some marketers of selenium supplements are touting it as the new wonder cure-all, saying it can treat everything from heart disease to macular degeneration, from cold sores to shingles. If you are interested in taking selenium as a supplement, consult with your GP first. Be aware that some supplements, even naturally occurring ones, can interact with other supplements, as well as with prescribed medications. Selenium can also be dangerous when taken in large quantities, and can cause unwanted side effects such as hair loss, nausea, vomiting, depression, nervousness, fatigue and even a loss of fingernails. Know what you are getting into before you make the leap - and don't believe all the hype. After all, some of it may be just hype!